Building a new coastal home? Follow our 5 tips for building a new coastal home and we are confident you will have an enjoyable experience. In 2016, Sea Island Builders was voted the #1 custom home builder in Charleston. Much of our success has been due to the happiness of our clients so we wanted to share with you our 5 tips for building a new coastal home. #1 - Hire the right team. Sounds easy right? Believe it or not, this where most people go wrong - right from the onset. When building a new coastal home, hiring a trustworthy contractor is critical to your project's success. Check their references, visit their job sites, check their reviews, and interview them extensively. You can't bug them enough! Do your personalities match? Do they understand your goals? Are they budget conscious? Do you trust them? These are important questions that you need answered prior to building a new coastal home. Having experience in building coastal homes is a MUST if building along the coast! You do not want to be the guinea pig for an inexperienced contractor in learning the hard way. #2 - Get the entire team involved early. Having your team assembled and involved when buying a property and in the early stages of designing a new coastal home will pay huge dividends. A qualified design-build contractor should take the lead to help you maximize your lot's potential and take advantage of it's greatest assets. Where does the sun rise/set? How do you see your family living on a daily basis? Where are the views? On top of this, your Contractor will provide invaluable costing information to aid in the decision making process. How much should you put into building a new coastal home given the real estate trends? Are there any building constraints to the site or soil conditions that affect structural design and construction? Eliminate potential mistakes and the chances of incurring rework and redesign by getting the entire team involved early. #3 - When building a new coastal home, design should be timeless. People change and so do trends. Keep this in mind when building a new home. Have your design-build team design a home that will stand the test of time and not only look good a year from now, but look good 20 years from now. New homes that have timeless design offer greater long term value to the homeowner, both emotionally and from and return on investment (ROI) perspective. 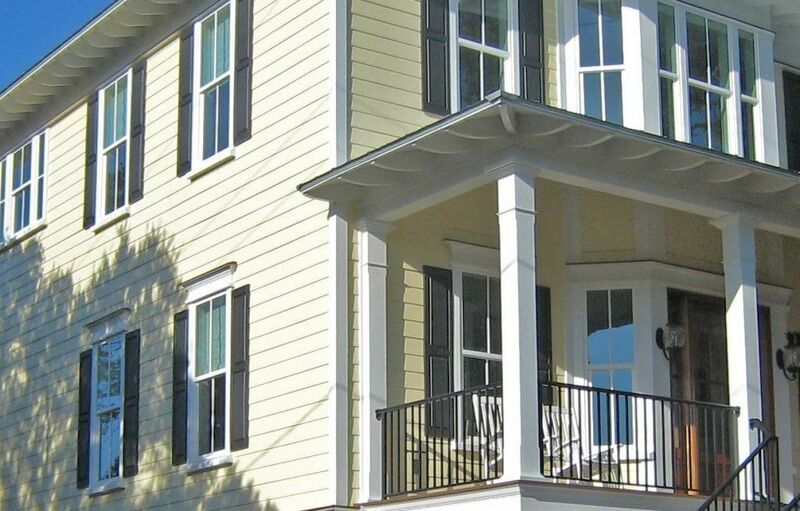 The materials used on coastal homes are ever the more important given the extreme conditions they are exposed to in Charleston's coastal climate. 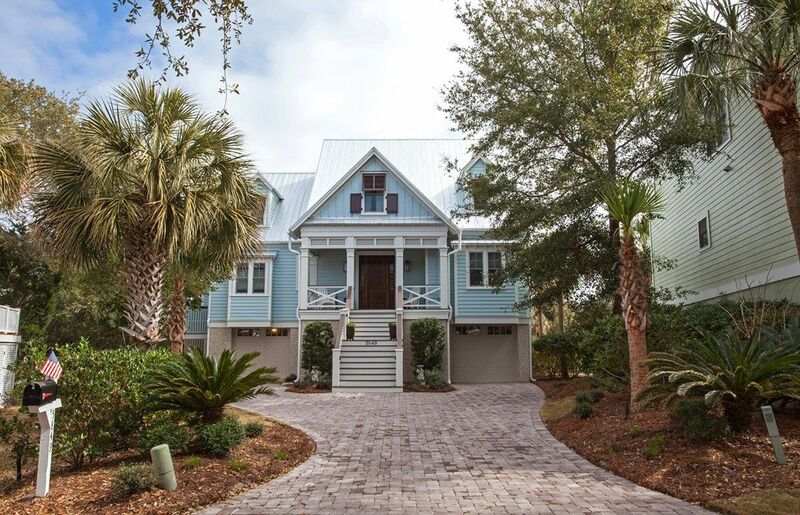 Custom home completed in 2016 by the best custom home builder in Charleston. #4 - When building a new coastal home, if you're going to splurge - splurge on the kitchen, master bathroom and laundry room. These are the 3 areas that a buyer will focus on if/when you decide to sell your home. A spacious kitchen, stunning master bathroom, and a functional laundry room will make your house shine above the rest. #5 - When building a new coastal home, have regular site meetings with your project team. Site meetings allow for more communication and keeps everyone accountable. Proper and constant communication from the subcontractor level through the contractor and with the ownership will ensure that there are no schedule surprises, budget surprises, and generally lead to a more positive building experience. Site meetings should be regularly scheduled. Budget and schedule update meetings should be performed no less than monthly. Just like any relationship, the more you invest in it the more fruitful it will be. When building a new coastal home, suggest regular site meetings and general project schedule and budget update meetings at least on a monthly basis. Communication is CRITICAL to a project's success! Sea Island Builders has implemented many quality controls including extensive plan review checklists and procedures that ensure every design is build ready BEFORE construction begins. This includes full HVAC design and implementation into the structural plans. Figuring it out on paper ahead of time always saves a bundle of time and money over figuring it out in the field. This is just another aspect that differentiates Sea Island Builders and makes us the Best Custom Home Builder in the Charleston area. There you have it! After many years of building some of the Charleston area's finest homes, we believe these 5 tips will help you achieve great success when building a new coastal home! Best of luck!